Aim: To evaluate the efficacy of transcutaneous triamcinolone acetonide (TA) injection for the treatment of upper eyelid retraction and swelling in thyroid eye disease (TED) patients. Patients and methods: This is a case series. 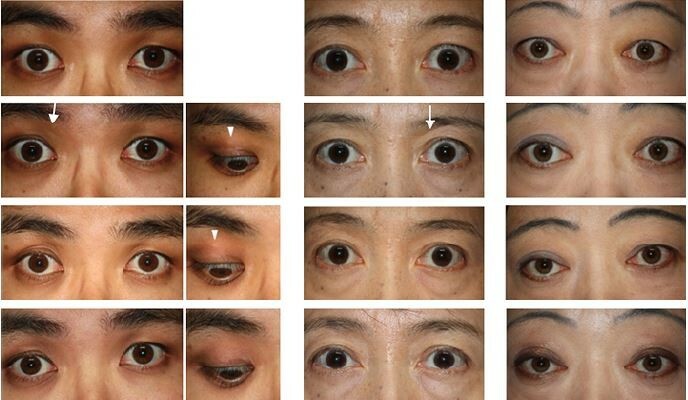 Three euthyroid TED patients with features of both upper eyelid retraction and swelling were recruited. TED signs appeared within 6 months prior to treatment. Next, 0.5 mL of TA (40 mg/mL) was transcutaneously injected targeting the orbital fat around the levator palpebrae superioris (LPS) muscle. At each visit, eyelid retraction was evaluated by palpebral fissure height and the presence of scleral show above the superior corneoscleral limbus. Eyelid swelling was judged by the appearance of upper eyelid bulging and the lack of an eyelid sulcus. In addition, the LPS muscle, orbital and retro-orbicularis oculi fat were observed using MRI before and after treatment. Results: Two patients had resolution of their upper lid retraction and swelling within 12 months. In the other patient who had proptosis, eyelid retraction resolved, while eyelid swelling remained mild. In all cases, MRI revealed that treatment resulted in thinner LPS muscle and reduced fat swelling. In addition, both high-intensity signals on T2 images and prolonged T2 relaxation time were normalized. No adverse signs were observed. Conclusion: Transcutaneous TA injection was effective as a treatment for upper eyelid retraction and swelling in euthyroid TED patients who had signs within 6 months prior to treatment. Transcutaneous TA injection induced reduction of LPS muscle enlargement and fat tissue swelling. These reductions by transcutaneous TA injection were verified using MRI.